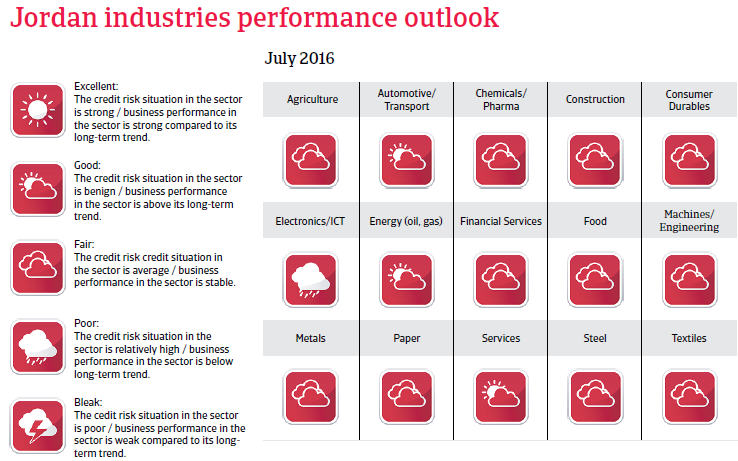 A modest economic rebound expected in 2016, but fiscal consolidation remains difficult. Jordan remains heavily dependent on foreign donors support. Form of government: Jordan is a constitutional monarchy, but the parliamentary power is heavily circumscribed. Despite some recent reforms most executive and legislative powers still lie de facto with the King, who is empowered to dismiss the government and dissolve the parliament. King Abdullah II appears to be firmly in power again following the public protests in 2011 and 2012. The King is also considered to be secure as he is rather popular and has strong support from the effective security forces and the army. That said, Jordan´s security situation has worsened in recent years as the country is immediately affected by the on-going sectarian conflict in Iraq and the civil war in Syria, together with the rise of the Islamic State (IS) in both neighbouring countries. Tourism, services and cross border trade have been negatively impacted. The share of refugees in Jordan has reached about 15%-20% of the country´s total population, which has increased pressure on infrastructure (e.g. water and electricity resources) and public finances. It has also led to some tensions between refugees and Jordanians due to the already high unemployment rate in the country. 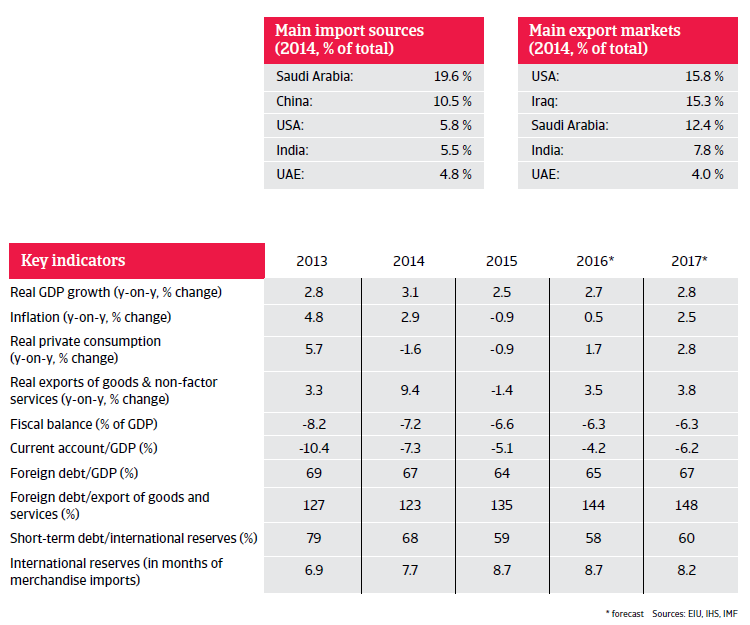 Jordan´s economic growth continues to be negatively affected by the on-going conflicts in the region. Trade flows with Iraq as a major export destination have decreased and tourism and investments are negatively impacted by security concerns. In 2015 tourism revenues alone declined 6%. 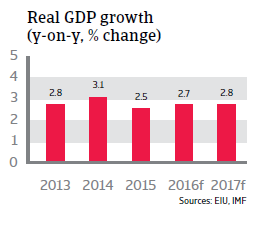 That said, growth is expected to rebound somewhat in 2016, helped by low oil prices (Jordan imports all of its energy) and government investments in infrastructure. After 0.9% deflation in 2015 due to lower oil prices and subdued private demand, a modest inflation rate of 0.5% is expected in 2016. Government debt is high and expected to reach 90% of GDP this year. The budget deficit is also high, but expected to decrease to 6.3% of GDP in 2016. Fiscal consolidation is difficult due to the massive influx of refugees. However, some improvement is expected due to reforms (lowering subsidies) and the low oil price. 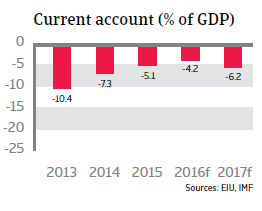 Since 2014, the current account deficit has decreased sharply due to lower oil prices, reducing the gross external financing requirement to 82% of reserves. Nevertheless, the financing requirement remains high, mainly due to the high short-term debt, which is related to trade. Financing the current account deficit is no problem due to good access to the international capital markets and financial support. The liquidity situation is good, as foreign reserves have increased due to external financial aid. Import cover amounts to more than eight months in 2016. Jordan remains heavily dependent on foreign donor support from its Arab allies (especially Saudi Arabia), the US and multilateral institutions.